This new innovation provides a unique solution to the age old problem of applying ambient, time-based effects to an amplifier’s sound without degrading the original sound in any way. Most guitar players are familiar with the issue; when applying time based effects such as reverb or delay before distortion, the sound “washes out” and becomes indistinct. The proper way to apply these types of effects is after the distortion — much as you would in the mix down stage in a recording studio. In classic vintage amplifiers and many non-master volume designs (such as our Komet amplifier lineup), the output stage employs distortion as part of the sonic recipe — but effects loops typically do not work well in those amplifiers. This is where AmbiKab comes in. AmbiKab allows the amplifier to directly drive a set of guitar speakers (“dry signal”) without any effects added directly to it. A portion of this dry signal is then split off by the AmbiKab’s internal circuitry and sent out into a effects unit. From there, a 100% effects signal (“wet signal”) is fed back into the AmbiKab where a separate, internal stereo power amplifier sends the signal to a dedicated stereo set of speakers. The AmbiKab features a send level control to accommodate a variety of effects — from floor pedals to studio quality rack units. On the return side, a volume control for the internal stereo amp governs the proportion of effects signal that is being added to the guitar sound. The AmbiKab can be used with mono effects (both stereo channels bridged) or in full stereo mode. The sonic results of this new cabinet system are astonishing! The amplifier reacts to the player’s input as if there were no effects employed at all (as the amplifier never actually “sees” the effects). 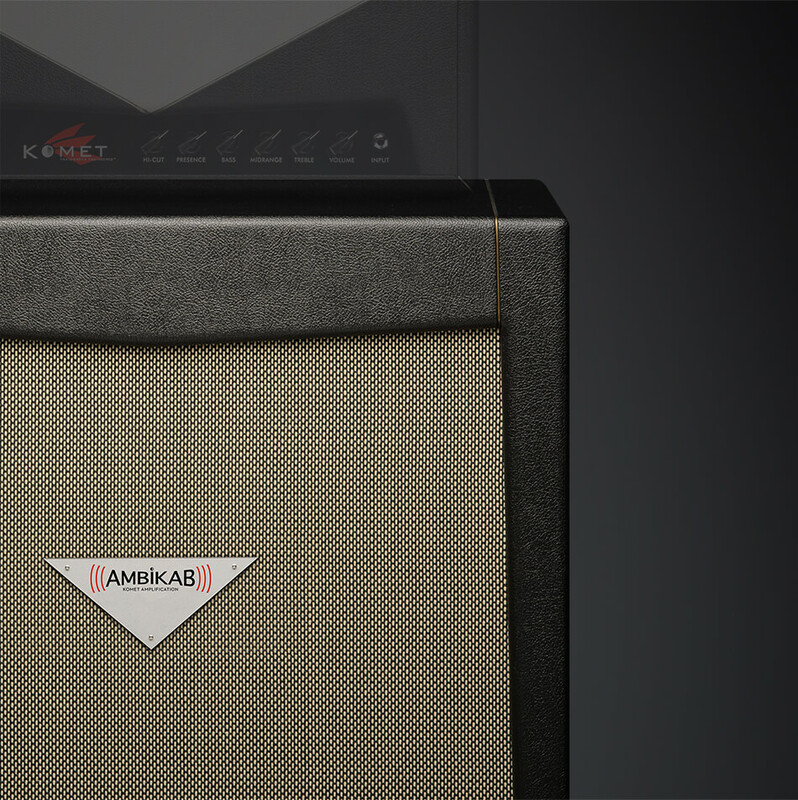 Komet™ Amplification is proud to announce our new, proprietary effects processing speaker system: AmbiKab™ (pat.pend.). This new innovation provides a unique solution to the age old problem of applying ambient, time-based effects to an amplifier’s sound without degrading the original sound in any way. Additionally, the ratio between wet and dry signals always stays constant; as the guitar player “rolls down” the volume to clean up the amplifiers sound or varies their picking dynamics, the effects signal changes proportionally to the amplifiers output signal. Players who have used traditional amplifiers with built in reverb will be familiar with this problem. If you set your reverb level for your lead sound, the reverb disappears when you roll down your volume for rhythm, and vice versa. The AmbiKab solves this age old problem. The AmbiKab gives you a true, studio quality effects sound anywhere, without the hassle of a traditional wet/dry/wet rig requiring additional speaker cabinets, amplifiers, mixers and cables. All you need is your favorite amplifier head, favorite effects, and the AmbiKab. The AmbiKab Junior offers all the effects handling capabilities of its big brother, minus the dry signal path. AmbiKab Junior is intended to be used with combo amplifiers that already feature internal speaker(s) for the dry guitar sound. Simply plug the AmbiKab Junior into the combo amp’s second speaker output and expand your amp into a full stereo wet/dry/wet effects rig — without altering your amp’s tone and response in any way. Having the AmbiKab Junior physically separate from your main amp and its speaker(s) greatly enhances sound imaging possibilities by positioning them in different locations for more extreme stereo separation. 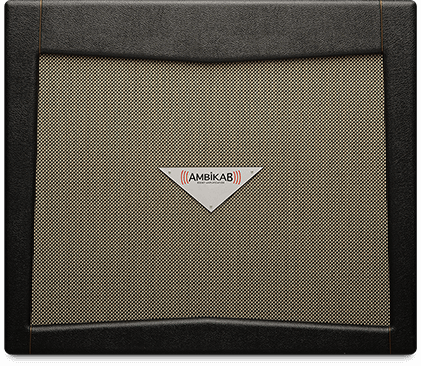 AmbiKab Junior is also perfect for players who already own a favorite guitar speaker cabinet. Simply run your amp through your preferred cabinet, and add the AmbiKab Junior by plugging it into your amp’s second speaker out jack for instant stereo-effects handling capability.